The Mendenhall Valley (historically Mendenhall, colloquially The Valley) is the drainage area of the Mendenhall River in the U.S. state of Alaska. The valley contains a series of neighborhoods, comprising the largest populated place within the corporate limits of the City and Borough of Juneau, Alaska’s capital. The valley was formed by Mendenhall Glacier over the course of roughly three thousand years. It was named for physicist and meteorologistThomas Corwin Mendenhall. The Mendenhall Valley begins ten miles from the downtown area, at the intersection of Egan Drive and Glacier Highway, and ends ten miles farther west at the intersection of Glacier Highway and Mendenhall Loop Road at Auke Bay. The Valley comprises an area stretching from the wetlands along Fritz Cove and Auke Bay back to the Mendenhall Glacier as well as Mendenhall Lake and the Mendenhall River, which for the most part drains the Valley. Source. On February 2, 2018, the Juneau Empire detailed how “several eyewitness reports” had told of a large bird with a wingspan about the “width of the Mendenhall Loop Road” being recently seen. Attn; I was just driving by the movie theater in the Valley and there was a huge black bird flying above the road. The wingspan had to be at-least 20 feet, it was almost as wide as the road. I have lived here all my life and have never seen anything like that, it freaked me out. It was not a raven or an eagle. This isn’t a joke. This thing was HUGE, almost the size of a small airplane. Did anyone else see it? “That sounds crazy, but it was huge,” she said. “I don’t even go camping anymore.” Source. The late cryptozoologist Mark A. 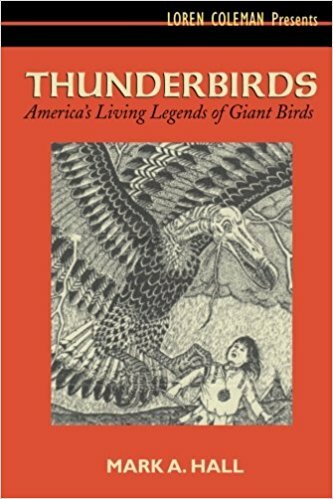 Hall documented in his book Thunderbirds: America’s Living Legends of Giant Birds (2004) that ethnographic and anthropological investigations published in 1870, 1874, 1881, and 1904 told of Thunderbird reports in Alaska. The accounts were from the Tlingit in the Alaskan panhandle and at Sitka, near Mount Edgecumbe, at the glacier near Katalla, from the Diomede Islands, near a mountain near Sabotnisky (present-day Fortuna Ledge), and around Kotzebue Sound, Alaska. 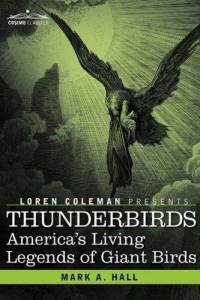 Then in 2002, new reports of large birds or Thunderbirds were recorded again for Alaska. Before the news had move on about this “flap” of sightings, during October, 2002, southwestern Alaskans were talking about seeing a bird the size of a small plane, and by the end of the month, David Letterman was making jokes and ABC News’s Buck Wolf was writing a thoughtful column about the event. Here is a CNN summary of the accounts dated October 18, 2002. ANCHORAGE, Alaska (Reuters) – A bird the size of a small airplane was recently said to be seen flying over southwest Alaska, puzzling scientists, the Anchorage Daily News reported this week. The newspaper quoted residents in the villages of Togiak and Manokotak as saying the creature, like something out of the movie “Jurassic Park,” had a wingspan of 14 feet (4.6 meters) — making it the size of a small airplane. “I’m certainly not aware of anything with a 14-foot wingspan that’s been alive for the last 100,000 years,” the paper quoted raptor specialist Phil Schemf as saying. History Channel did an episode on “Missing in Alaska,” regarding Mt. Marathon on Thunderbirds (see here). Ken Gerhard is the featured cryptozoologist, and he is quoted detailing cases and theories noted previously by Mark A. Hall, Karl Shuker, and me. 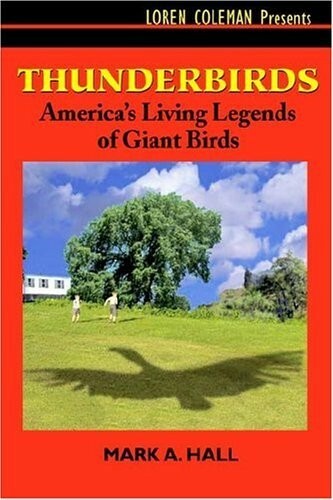 For more, see Mark A. Hall’s Thunderbirds: America’s Living Legends of Giant Birds (2004).